Learn all ins and outs regarding philosophy. Complete course; 16 lessons written. What is our purpose? Can we uncover hidden mysteries of life and understand the forces that affect us all? If you have a creative mind that questions the world around you and never feel afraid to explore theories, express doubts or challenge stated arguments, then you are the right person for this Philosophy course. You will learn the principles of philosophy; studying the lifework of the ancient thinkers such as Thales, Socrates, Plato and Aristotle or the more modern ideologies of Kant, Hegel, Darwin, Marx and Freud, among others. This philosophy course will assist you on your journey to a higher level of knowledge, increasing your ability to define and perceive basic concepts of philosophy. The thoughts of notable analytical visionaries will be examined along with their logic and arguments. Challenge your beliefs, strengthen your powers of logic and learn to draw your own conclusions about life and the world around you. So, philosophers, what do you think? "Introduction to philosophy" is for everyone who is interested in learning more about philosophy. The history of philosophy is discussed, along with important philosophers and all kinds of philosophical theories. No specific prior education is needed to take the course. Every lesson has an interesting topic with a practical assignment at the end - so it combines theoretical knowledge with applying the learning. Please fill out the form and you will receive the example lesson "Pre-Socratic philosophers" in your mailbox within minutes free of charge. 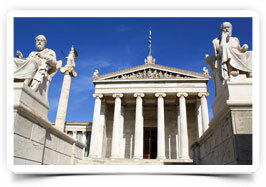 Socrates, Plato, Aristotle, Marx and other philosophers will be discussed. You will also learn many philosophical theories; from thousands of years ago to recent ones. And everything is thaught to you in such a way that you can easily understand and apply the learnings. Within months you have gained a lot of knowledge about philosophy and you will be able to converse about all kinds of philosophical topics. When you are learning about philosophy it is good to get the confirmation that you are doing it the right way. You would like to know if you are on the right track. 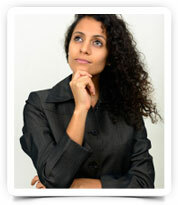 You would like to get dedicated, personal advice on the assignments you made. And if you happen to be stuck or do not understand something you would like to ask for help. 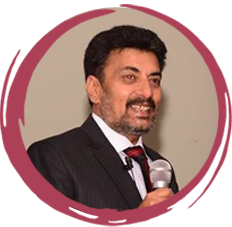 This personal help is given by our personal teacher, who teaches about philosophy and who has written several books. The majority of the students decide to sign up for the philosophy classes and hire the services of a personal teacher. Students who do so are allowed to ask for advice, questions and hand in assignments for grading. Students who choose for self-tuition take on the course by themselves. They cannot ask for advice, questions nor can they hand in assignments for grading. You have the opportunity to take the introduction to philosophy exam by the end of the course. This is optional and you decide for yourself if you would be interested in this. When you pass the exam you will receive the Didacton Certificate of Achievement for introduction to philosophy. You can take this exam from home and you will have to apply the learnings from the course to pass the exam. The costs of the exam are $ 99.90, but if you decide to sign up for the exam when you book the introduction to philosophy course, then we can offer you a discounted price of $ 39.90. 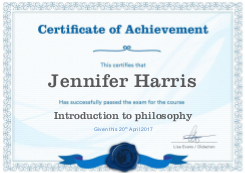 You will receive the latest version of the philosophy course when we are improving the contents of our philosophy lessons; free of charge. Whenever there is an update, you will get it. At the end of every lesson we ask you some questions in order for you to reflect some of the contents of the lesson. This will make you apply the learnings and think about how you see certain philosophical questions and theories. By making you think like this you will find your way how to apply to learnings to your values and ideas. This personal touch is much appreciated and gives you guidance. You are learning all about philosophy. And you will be able to share all your experiences with other philosophy students in our learning management system. Would you like to share ideas? Would you like to meet up with others? Or would you simply like to ask the opinion of others? You can do this and much more in your Didacton learning management system (lms). The lms is the focal point of your philosophy classes with Didacton. In it you will be able to take the philosophy course, interact with the teacher (optional), hand in assignments (optional) and see your grades (optional). Furthermore you have the opportunity to spice up your personal profile and interact with other students in the community. We are striving to improve and expand the lms continously and your feedback will be much appreciated. One of the main advantages of taking online philosophy classes is that you decide how much time you would like to take for every lesson. The course consists of 16 lessons. If you work on one lesson every week you are done in almost four months. But you decide your pace - you can take more time or go faster. You have one year access to the lms, but this can be increased upon request. You also do not have to worry that other students are faster or slower than you are. You decide your pace and you do not have to worry about others. You can access the lms with your desktop, laptop, smartphone or tablet. This means that you are fully flexible with which device you would like to take the philosophy classes. Furthermore this means that you can also study wherever it suits you, whenever it suits you. You only need access to the internet. Do you want to take the online philosophy course? Then click on the "Buy now" button at the top of the page. You will receive the login details by email and you can immediately start with the philosophy classes in the lms. This can be done on your desktop, laptop, tablet or smartphone. Would you like to see what an actual lesson looks like? Please fill out the form and you will receive the example lesson "Pre-Socratic philosophers" in your mailbox.